While most geckos inhabit tropical and subtropical regions, a few species live in temperate areas. Like most other non-avian reptiles, geckos derive their heat externally; in cold temperatures, their internal processes slow down and they cannot move quickly enough to capture prey or escape predators. To cope with this, geckos retreat to somewhere safe and lay low until warm temperatures return. Terrestrial geckos hibernate in the same types of places that other small reptiles do. In regions with mild winters, geckos may be able to hibernate inside a rotting log or under a small, flat rock. In areas with very cold temperatures, the geckos must travel beneath the frost line to avoid freezing temperatures. Rock crevices, caves and animal burrows are likely spots for terrestrial geckos to avoid severe winter temperatures. Many species that live in areas with cold winters -- such as desert banded geckos (Coleonyx variegatus ssp.) 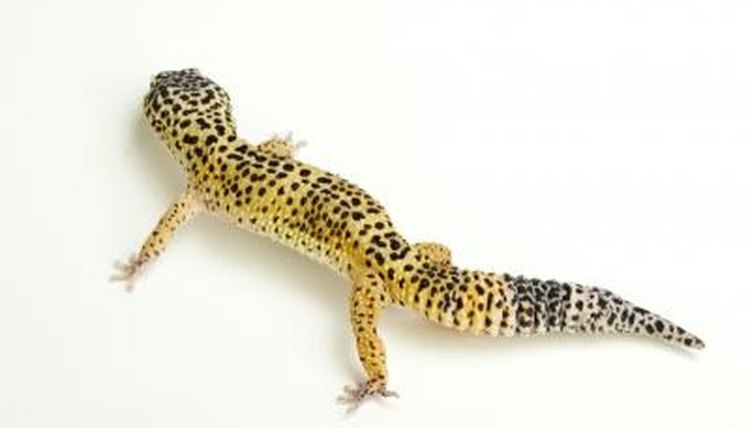 and leopard geckos (Eublepharis macularius) -- build up large fat stores in their tails. These fat stores help the lizards to survive long periods without food, such as when hibernating. Arboreal geckos have a number of places that they can use for hibernation locations. Many older trees are partially hollow on the inside and geckos can access these hollows and remain well-insulated from the cold. If winter temperatures are not too cold, the geckos may be able to retreat under the bark of the tree and safely await the spring. Geckos living in the tropics do not ever have to cope with cold temperatures, so they don’t have to hibernate. However, some areas have temperatures that are too warm for the geckos; during these hot periods, some geckos may aestivate in places similar to those used by hibernating geckos -- under bark, logs or rocks or inside tree hollows. When the moderate temperatures return, the geckos can become active again. Winter dormancy often serves to synchronize the breeding cycles of geckos. Many species will begin breeding shortly after emerging from their hibernacula. Some geckos -- particularly those living in areas where suitable hibernacula are rare -- may hibernate communally. Other species defend their winter retreats with the same ferocity as they do their summer retreats.